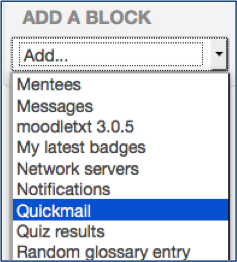 Quickmail provides you with an additional communication method in Moodle. 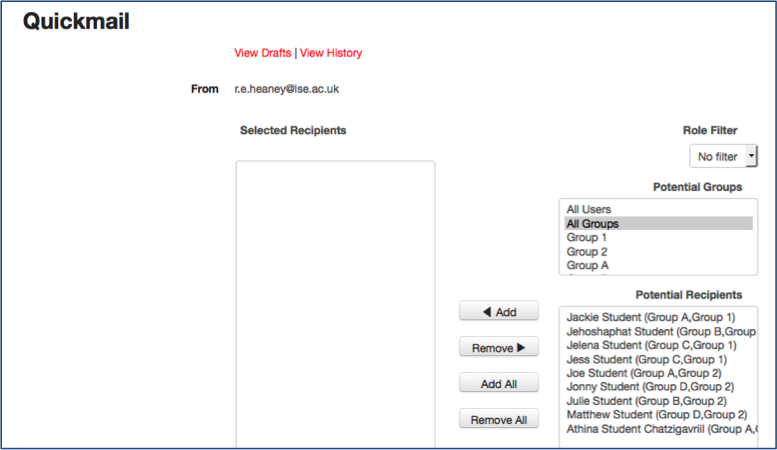 It is useful for bulk emails and, unlike other communications from Moodle, it will be delivered immediately regardless of any digest settings in a user’s profile. However, it is an outgoing mail service only. Replies, if allowed, will be to the sender’s email address. Go to the course on which you would like to use it and Turn editing on. 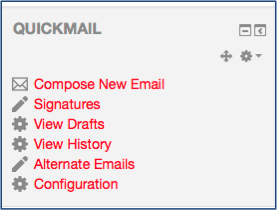 Scroll down to Add block and select Quickmail from the list. The block appears with various email options. 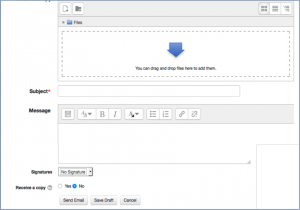 Click Compose New Email to create an email. 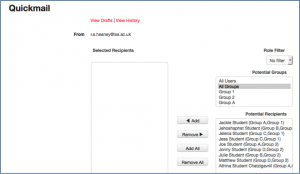 In recipients you have the option to select the whole cohort, a group or individual students. Select those you want and click Add (N.B. you also have the option to filter by role e.g. to send a message to students only). Compose your message, add attachments, use any predefined signature, select whether you would like to receive a copy and Send email. Once emails are sent, you have a record in View History. N.B. Recipients receive messages at the email address specified in their Moodle profile i.e. their LSE email account.